I feel sometimes that I am just picking things up off the floor of my studio and finishing them. I had these three rivers from last year but they were not quite done somehow. I had some blue beads I’d made from colored porcelain and a friend had fired for me, and the yellow shells from the last several summers on Mohegan, but it took a while to settle on all those red buttons for the last one. And then they were clearly related, and also clearly done. I will frame them up as a trio in a single frame, and call it good. 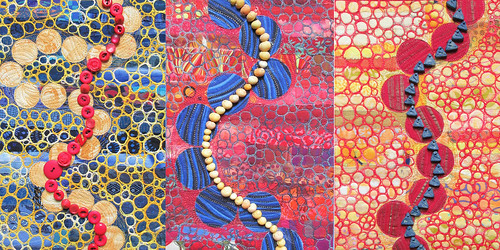 I had two pieces accepted to the Quilt Surface Design Symposium in Ohio. That feels like huge compliment. I was looking at the classes offered, but couldn’t swing it financially. Closer to home, I had another piece accepted into Catch and Release, a show at the Great Falls Discovery Center in Turner’s Falls, Massachusetts, just up-river from us in Northampton. I’ve been spending a lot of time looking at other peoples’ work, looking for the things I find compelling. That is always interesting. I’ll show you my scribbled notes on that sometime! Checking again to see if WP will allow me to comment because this is BEAUTIFUL. I love snails/snail shells and circles and triptychs and this piece is just right up my alley is what I’m saying. edit: WP did not, in fact, allow me to leave a comment under my WP account so I’m using a different account and maybe it will work? I’m so pleased to hear it is working for you, thank you for saying so!